Scientist Davide Iannuzzi and his team have developed a method to place novel miniaturised mechanical devices on the tips of optical fibres. The technology has many applications, such as providing a new generation of small, super sensitive sensors for research, medical, and industrial applications. The team received support from the European Research Council (ERC) in the form of two grants. The first EU-funded project was called FTMEMS (‘Fibre-top micro-machined devices: ideas on the tip of a fibre’) and he secured the second one, called FTBATCH (‘Small, but many: scalability to volume production in fibre-top technology’), to demonstrate that the technology could be scaled up to market competitively. Iannuzzi likens the round end of the optical fibre to a swimming pool and the ‘fibre-top cantilever’ to a diving board. Inspiration for the idea came to Iannuzzi, Iannuzzi, who is based at the Vrije Universiteit Amsterdam, while he was conducting experiments in fundamental physics. The usual approach of shining a laser beam onto a cantilever was unwieldy and was not always accurate. This innovative idea possesses a number of clear advantages. By combining the mechanical reliability of micro-electro mechanical systems (MEMS) with the precision of optical fibre interferometers, it is highly sensitive. In addition, its all-optical sensing and portable size means it can function in extreme conditions and be controlled remotely. Without the backing of the ERC, Iannuzzi would have had a much harder time proving the commercial worthiness of his innovative ideas. ERC support helped the researcher to scale up the production processes and analyse the market potential of different applications. One of the most promising uses of this technological breakthrough is as ultra-versatile, super-sensitive sensors. 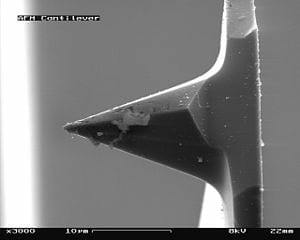 For example, fibre-top cantilevers can be used, without the need for bulky and expensive equipment, for atomic-force microscopy (AFM) to record, ‘like the stylus of a record player’, the surface of an object with a nano-scale resolution. Numerous other promising avenues exist for the fibre-top cantilever, such as minimally invasive surgery. With all this potential at stake, Iannuzzi discovered that being in the lab was not enough and decided to take his idea to market. Drawing on the Italian tradition of design excellence and small-scale innovation and the Dutch acumen for transforming ideas into profitable products, Iannuzzi established, in 2011, a start-up called Optics11. In fact, the firm is pursuing a customer-driven approach to its patented technology. Through interactions with scientists and researchers in various fields, says Iannuzzi, Optics11 is able to identify exciting new ideas for applications. Given the well-documented difficulty Europe experiences in translating research into innovation, fellow scientists may wonder how Iannuzzi finds combining a lab coat with a business suit, so to speak. “I find being an entrepreneur very interesting and very exciting. It’s very stimulating,” he enthuses. What advice would this scientist-entrepreneur give other researchers wishing to take the leap into business? “It requires a change of mindset. You have to know that this is not your field, so you have to be open to learning and getting the right help and advice,” he says. And this is exactly what Iannuzzi has done, seeking assistance from his university’s technology transfer office and teaming up with a professional entrepreneur to run the firm. Iannuzzi has also become an unofficial adviser and mentor to fellow scientists at his university, helping them to consider the best way to bring their ideas to market. “I don’t want to live in a world without philosophers,” he concludes.